At a walkable 8.3 square miles, Santa Monica offers more activities and adventures for families than most areas of the United States. With everything from art, biking and volleyball to beach days and surf lessons sandwiched in between, Santa Monica has something for every member of the family. Many families come to Santa Monica because of the beach, however Santa Monica activities include so much more. Below are five Santa Monica activities that are fun for the whole family and will make you want to plan that family vacation today. One of the most exciting things to do in Los Angeles with kids is to show them around town when your first arrive! That way, both you and your children have a lay of the land and can choose what you want to explore more of as your vacation continues. A Day in LA Tours will take your family on a one-day adventure to explore Santa Monica, Los Angeles, Venice, Beverly Hills and Hollywood. A tour guide will tell stories as you go along and you’ll have 45 minutes at each stop. If you have outdoor adventurers along for the ride, you and your family can experience a famous California activity this year: surfing. Aqua Surf School offers surf lessons for children, teens and adults of all abilities from instructors who are not just certified in CPR, first aid, life guarding and safety, but who are also blessed with the gift of great conversation and are passionate about surfing and teaching. Based on Santa Monica Beach, Aqua Surf School offers private surf lessons every day, all year round and hosts surf camps and classes for children and teens. A great way to see up and down the coastline is to join The Legends Beach Bike Tour for a two-hour guided tour along Santa Monica Beach, the Santa Monica Pier, and past the homes of Hollywood stars. You’ll even get to stop at Santa Monica’s famous Original Muscle Beach and see the Venice Canals. Also known as “the place where art happens,” 18th Street Art Center is one of the top twenty artist residency programs in the United States. What does this mean for you and your family? Endless art exhibits to inspire your budding artists. Featuring artists from around the world, 18th Street Art Center supports creators to envision, research and design new art to share with the public to foster imagination, compassion and positive change. Both children and parents can admire the paintings, installations and sculptures that are housed here on a rotating basis. Santa Monica Beach has been featured in countless movies and magazines and has become an icon for California travel. At 3.5 miles long, it has beautiful, soft California sand, which is perfect for the kids to build sand castles in. If you’re north of the pier, Santa Monica State Beach is separated from the city by an ocean bluff and the Pacific Coast Highway. The Annenberg Community Beach House offers a public pool, onsite café, historic home to tour and much more to fill the day with. The North Beach Playground provides swings, slides and climbing equipment to inspire activity, mobility and imagination in all children. And, we can’t forget the Santa Monica Pier! Featuring an amusement park (Pacific Park), aquarium, carousel, and restaurants, the pier is a landmark for the beach and the city. Santa Monica Beach on the south side of the pier features the Original Muscle Beach, International Chess Park and Carousel Park. When visiting Los Angeles with kids, or on a weekend getaway, no trip is complete without a visit to the beach. 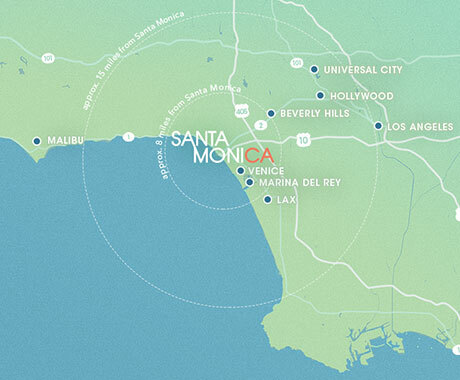 All Santa Monica hotels are within four miles of the ocean and many are within walking distance or adjacent to the sandy shores of the Pacific. 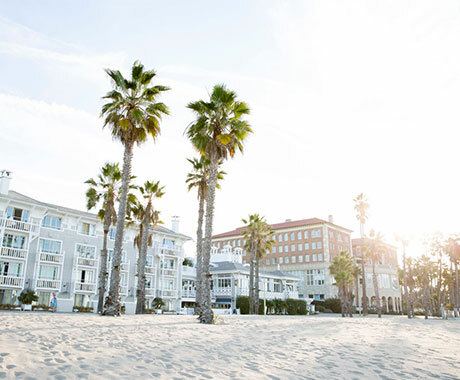 Find one of the 40 hotels in Santa Monica to make your home base while visiting Southern California.